de la Vaissière, Etienne. 2016. 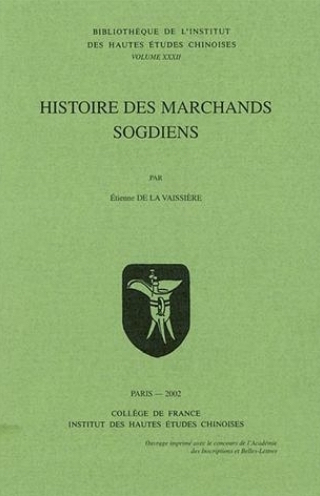 Histoire des marchands sogdiens. Troisième édition révisée. (Institut des hautes études chinoises (Collège de France) 32). The Sogdian Traders were the main go-between of Central Asia from the fifth to the eighth century. From their towns of Samarkand, Bukhara, or Tashkent, their diaspora is attested by texts, inscriptions or archaeology in all the major countries of Asia (India, China, Iran, Turkish Steppe, but also Byzantium). This survey for the first time brings together all the data on their trade, from the beginning, a small-scale trade in the first century BC up to its end in the tenth century. It should interest all the specialists of Ancient and Medieval Asia (including specialists of Sinology, Islamic Studies, Iranology, Turkology and Indology) but also specialists of Medieval Economic History. This volume is the third revised edition of the orginal published in 2002 and translated into english in 2005 by James Ward. Étienne de la Vaissière (PhD 1999) in History, is Assistant Professor at the École Pratique des Hautes Études in Paris. His courses and research are devoted to the economic and social history of medieval Central Asia.